Football card collectors love opening boxes. Every pack is like another gift, another set of surprises, more to add to their collection. If you're looking for holiday shopping ideas, a fresh hobby box is likely at the top of any collector's wishlist. Almost always, hobby boxes are the way to go. These are the boxes sold at card shops and through dealers. Often, they're packed with more of most desirable cards that come with autographs and memorabilia pieces. Retail packs and boxes, the ones sold at places like Walmart and Target, have longer odds and don't pack as much punch. If you don't have a hobby shop nearby, hobby shops are still an option. eBay is loaded with dealers and sellers, offering some of the best prices. Their Buyer Protection Program ensures that buyers are protected as well. When it comes to picking boxes for presents, the number of options can be daunting. Our handy gift guide includes popular choices across several price ranges. 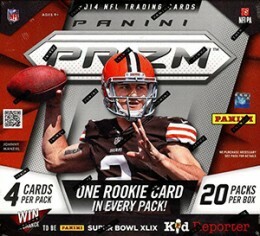 2014 Panini Prizm Football is a relatively straightforward product. The chromium look lends itself to a slightly more upscale look and feel. But it's still one of the cheaper products on the market as it doesn't stress lots of autographs and memorabilia cards. Hobby boxes have signed cards, but the appeal is more towards those who like to build sets and collect colorful Prizm parallels. Valor was last seen as a brand in 2012. At that time it was a high-end, hits-focused product. That's been scaled back and so has the price. Bold, gladiator-inspired themes are what remain. 2014 Topps Valor Football hobby boxes come with a pair of autographs and two relic cards. Traditionally, Topps Chrome Football has one of the biggest followings each year. Like Prizm, it has the chromium look and parallel rainbow. Rookie autographs are also usually very popular. But with just one per hobby box, pack prices start out very reasonably. 2014 Topps Chrome Football releases on November 26, which leaves plenty of time to get it in time for the holidays. 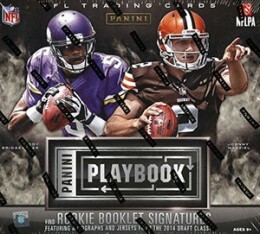 2014 Panini Playbook Football has a new configuration. Even with a lower price tag than previous years, that makes them something of a risk. However, there are some very interesting book cards that can be found, showcasing everything from jerseys with plenty of visible use, multi-memorabilia combinations, rookie autographed memorabilia cards and more. Those who collected in the late-1990s will recognize this brand brought back from Upper Deck. The college-themed product combines foil designs and autographs from both 2014 rookies and retired greats. 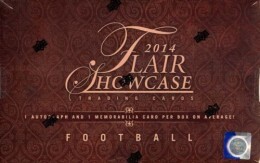 2014 Flair Showcase Football boxes have at least one autograph as well as either a second signed card or premium Jambalaya or Precious Metal Gems insert. 2014 Leaf Best of Football isn't your traditional set of cards. Boxes come with one old card that is either graded or autographed. Many of these cards are high-grade classic rookie cards, popular inserts and high-end autographs. It's a great way to take a chance on getting a great card from the past that might be too expensive buy separately. Each box also has a Rookie of the Year Predictor that could be good for a piece of signed memorabilia should they win the year-end award. 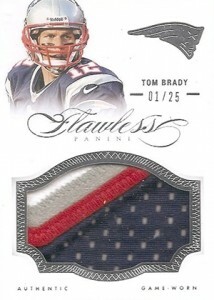 2014 Panini Flawless Football is the first product to top $1,000 per box. The hobby has come a long way in the last 30 years. So what does a grand (and then some) bring? Seven autographs, two jumbo memorabilia cards and a base card that has a diamond or other gem embedded in it. All cards in the product are numbered to 25 or less.